I hail from VentHub. 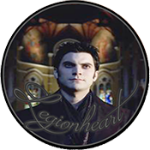 My alias is Legionheart but my real name is Chris. I am 21 years old and a HGM(Head Game Master) for R2Games' Browser Based MMORPG 'Winterfrost Legacy'. I have used forums from forumotion for 6+ years now. I was recently promoted to a ESF Reviewer. I love to help others. Which is part of why in August I'm going to the seminary to train to become a priest. Other than that I love Anime and Manga with my favorite being Bleach: by Tite Kubo. I play the game yugioh, though I'm not active as much anymore. And yes I am a cool person according to most xD. Greetings and Welcome to the Gateway! ^^ I hope you enjoy your time here; just take a look around! If you have any questions, don't hesitate to ask a staff member. Welcome to GTR Legionheart. *hands over caramel brownies* I hope you have fun, post lots, and visit the chatbox. Welcome to GtR! Hope to see you around and role-playing. Have fun! I'm also a big anime nerd ;D !!! Yeah for animuuuuh ! Thank you for the welcome everyone!